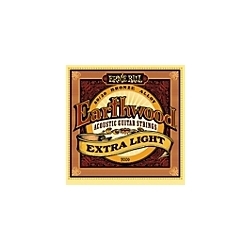 Ernie Ball 2006 Earthwood Extra Light Gauge, 10-50, guitar strings make any acoustic sound and play great..
Ernie Ball 2002 Earthwood Acoustic Guitar Strings are crafted from 80% copper, 20% zinc wire wrapped around hex shaped tin plated steel core wire. This most popular acoustic provides a crisp, ringing sound with pleasing overtones. All Ernie Ball strings are precision manufactured to the highest standards and most exacting specs to assure consistency, optimum performance, and long life.